For a very clean installation, use our avionics tray to create a custom avionics stack that is state of the art. 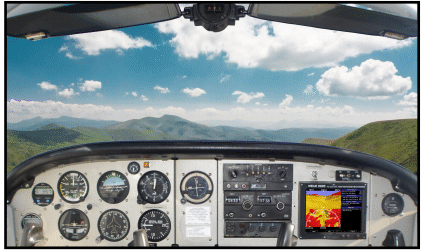 The Helm X650 Panel Mount Aviation GPS/EFB is designed to mount in the avionics stack of any aircraft. Its shallow depth means that it will install in aircraft like the old Cessna’s which are limited in depth behind the panel. 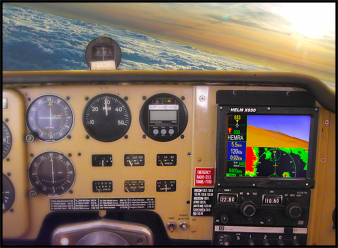 The picture below shows an installation in a C35 Bonanza. This avionics stack will not allow the installation of standard avionics at the top of the stack because of limited depth. However, the X650 fits with no problem. Ball studs, attached to the back of the Helm X650, allow it to simply snap in and out of the Tray. This maintains the portable status of the X650. A log book entry by an A&P is all that is required for a certified aircraft like this Beach Bonanza or a Cessna 172, etc.